KLAVIKON reimagines ‘electronic’ music without the use of conventional processes – no loops, no laptops, no sequencers. 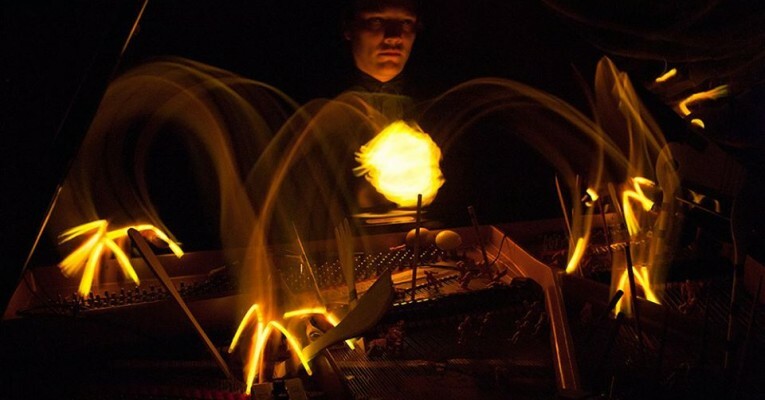 Instead, pianist Leon Michener employs a unique system of amplified prepared piano. Augmenting the 88 keys with his own inventions and found objects – a custom made pick up, a robot dog- he delivers cascading batteries of percussion, sub-basses and abstract soundscapes. This amalgam of virtuosic technique and real-time analogue processing is at once connected with Classical traditions of Stockhausen and Cage and the experimental dancefloor idiom of Amon Tobin and Bochum Welt. The result is a fertile sonic territory, sincere in it’s eccentricity, restlessly inventive, that resists easy categorisation. During FAQ Festival Klavikon will perform a special live set for prepared grandpiano on the beautiful Steinway of the Toonzaal.